"Gules, issuant from the base a ragged cross couped vert between two ducal coronets in chief or, and the lower limb of the cross enfiled with a like coronet. "—College of Arms, 1898. The town "beareth for their coat armour, argent, two ragged staves in cross vert, between three coronets, two in chief and one in base or, the ragged staff in pale, passing through the coronet in base." "Gules, two staves raguly and couped one in pale surmounted by the other in fesse vert, between two ducal coronets in chief or, the bottom part of the staff in pale enfiled with a ducal coronet of the last." "Nottingham, Town of, gules, two staves ragulee couped, one in pale, surmounted by the other in fess vert, between two ducal coronets in chief or, the bottom part of the staff in pale, enfiled with a ducal coronet of the last." In all these instances it will be observed that the charge on the shield is described as being two staves, not as a cross. On John Speed's Map of the Countie of Nottingham, dated 1610, the charge is shown undoubtedly as a cross couped at all its limbs, not as two staves; but he, like Guillim, describes the shield as argent. This appears to be the oldest representation of the arms now extant. The Nottingham halfpenny1 of 1669 indicates on the obverse a cross as issuing from the bottom of the shield. Dr. Thoroton, in his "Antiquities of Nottingham" (1677), on a map of Nottingham town, shows the "Arma Villae Nottinghamias" as having a gules shield charged with a ragulee cross vert couped at all limbs, and Blackner, in more recent times, follows Dr. Thoroton in this particular. "A careful and exhaustive search has been made amongst the records of this College in respect to the correct arms of Nottingham and from the enclosed tracings.2 You will notice that in each case the arms are represented as a cross raguly and not, as you mention, two staves raguly, one in pale and the other in fesse, as shewn in the tracing you sent me. I fail to find any authority for the latter.....So far as I can trace, the Visitation of the County of Nottingham made in the year 1614 is the only authority for the arms." It will thus be seen that a considerable complexity of descriptions of the town arms is furnished by various authorities on such matters. At the time (1898) when the College of Arms pronounced their ruling, i.e. when Nottingham was made a city, and received an augmentation of honour by being granted supporters, a coloured sketch was furnished by the College, which showed a great incongruity, for in it the cross was not shown to issue from the base of the shield! From this sketch the town authorities caused dies, transfers, and so forth to be made for use in such places as the town arms appear, and in the Council Chamber, the Guildhall, on the panels of the tram cars, prison vans, also on the new statue of Queen Victoria, recently erected in the Market Place, etc. Thus an erroneous representation of the arms, as laid down by the present highest authority in the kingdom, namely the College of Arms, is being perpetuated. to the Editor of the Nottingham Daily Guardian. The letter attracted the attention of the Council of the Thoroton Society to the subject, with the result that steps were taken by that body to have the arms, if possible, once for all definitely settled. A fee was paid in order that a renewed search might be made at the College, with a view to ascertaining what the Heralds could find to authenticate the above description, which they had decreed as being the correct one. 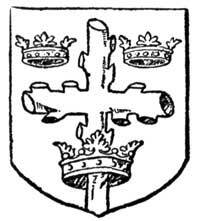 "The earliest official record of the Arms of the City of Nottingham is to be found in the Visitation of 1614, where the Coat is represented as gules, issuant from the base a ragged cross couped vert, between two ducal coronets in chief or, and a like Coronet enfiling the lower limb of the Cross. This is the Coat which is tricked in Vincent's copy of the same Visitation. (Vincent was Windsor Herald 1624-5) but in another of Vincent's MSS., No. 187, the Coat is represented not issuing rom the base. This MS., however, is not a record. M. 5, fo. 21, an early 17th century MS., but not a record, likewise gives the Cross couped at all four limbs, as also does Philpot 6, 7, fo. 19b, but this too is not a record. It will, therefore, be seen that the Arms officially recorded for the City of Nottingham give the Cross as issuing out of the base of the shield, and they should continue to be so borne. Controversy concerning these arms does not, however, cease with the exact technical heraldic description, or whether the charge should be a cross or two staves, or whether the arms show an heraldic error in placing a colour on a colour, which, in heraldry, as every one knows, is not permissible. The heralds do not challenge this, because the fact of the lower limb of the cross passing through the ducal coronet in the base lifts it off the ground of the shield, so to speak, and thus saves the blazon. It is interesting, however, to turn attention to what could have been the origin of the arms, and their significance. They are closely identical with those of the Borough of Colchester, but there is no established affinity between the two places to which the similitude in their armorial bearings can, with safety, be attributed. "That the three Crowns have reference to and must be regarded as being associated with the three nails. This reduces the arms to perfectly simple elements; the Cross of our Lord, pierced by three crowned nails. We may thus at once see, firstly, why the lowest Crown encircles the Cross, because it then hovers over the third nail, and secondly, that the honour due to the hallowed nails, which are otherwise liable to be overlooked, is clearly and emphatically set forth by the Crowns in a manner quite in accord with mediaeval usage . . . . These arms may, in fact, be regarded as the well known emblems of the Passion reduced to their simplest elements." He adds that he can only suggest that it is a mere coincidence that the arms of Nottingham are identical with those of Colchester. It is thought by some that Colchester acquired arms at an earlier date than Nottingham, for they appear on a charter, granted to the former town by King Henry V., so long ago as 7 July, 1413, and they are recorded in the College of Arms in 1558, whereas the oldest authority for the arms of Nottingham appears to be, as already stated, St. George's Visitation of 1614. It is impossible not to think that Nottingham possessed its own arms previous to this date, for in the later years of the 15th century it was the law of the land3 that all cloth had to carry a leaden seal bearing the Royal Arms, as well as the arms of the town in which the fabric was made, as a guarantee that the piece produced was of the size prescribed by law. That Nottingham at that time was one of the leading industrial towns in the kingdom is incontestible, so there can be little doubt that it then possessed, and possibly had possessed for some years, its own coat of arms, and there is no reason for thinking that they varied materially from the arms, the use of which has descended to the present day. (1) This halfpenny is inscribed "Nottingham halfpenny changed by ye Chamberlains 1669." (2) That given at the commencement of this paper and two others. (3) 1 Richard III., cap. viii., para. vi. " . . . . Seals shall be provided and ordained by the treasurer of England, to be printed in lead, having the King's arms of England on the one side, and on the other side the arms, sign, or token of every city, borough, or town within the realm of England, where the cloth is made . . . . . ." The official on whom the duty of affixing this seal devolved, was called an "aulnager." There appears to have been considerable rascality practised by cloth makers in these days.